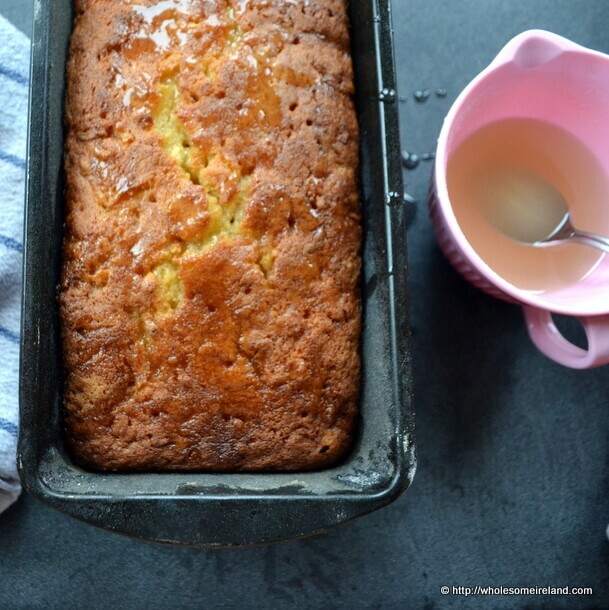 Lemon drizzle cake, but not as you know it. This sweet potato cake is moist, surprisingly light and I promise there isn’t a hint of savoury potato flavour hidden under the tart, sweet, crunchy topping made from lemon juice and caster sugar. In fact, I’d go so far as to say you’d be fooled into thinking there wasn’t a bit of potato anywhere near this cake. Sam Dennigan’s, the company behind the marketing label “Sam’s Potatoes” contacted me recently and offered me some samples from their pre-packaged, convenience range to try out. North County Dublin is (I suppose) the potato capital of Ireland and so I am lucky enough to live quite near to one of their main hubs. The concept of their convenience range is simple: A small number of potatoes in a specially designed microwaveable package which can be cooked in as few as 7 minutes, depending on the potatoes contained within. If you’re looking for just a few spuds that you can serve up for dinner with no preparation then these are the potatoes for you. These potato packs are great quality, it’s just that for me it’s quicker and cheaper to grab a large 10kg bag of potatoes and manage my quantities myself even if it does involve peeling and preparing them. Yesterday was Potato Day in Sonairte. I was stuck in the house with 2 sick children, and feeling decidedly under the weather. It had not been the plan. I had intended to go up to hear the inspiring speakers, watch the demonstrations and while away my Saturday with like minded people. One of the features of the day was a range of specialist potato dishes which was to be served in the Sunflower Cafe and I was really disappointed to miss this. I figured if I couldn’t go to Potato Day, I’d bring it to me. The cake isn’t actually made from sweet potatoes at all, it contains 2 medium roosters which bring moistness to the mixture. You don’t need to cook or prepare the potatoes too much in advance apart from peeling and grating them. Something the kids had great fun with messing around with the sizes of grater until they got the desired effect (medium or small sized grater by the way). The verdict from my discerning family is that this is the nicest lemon drizzle cake I’ve ever made. Which is just as well considering I had to make it twice today after I forgot to include baking powder when testing the recipe this morning. I was pulling my hair out and felt very guilty (see the player to the right hand side of this page to hear more about my cooking disasters this week). 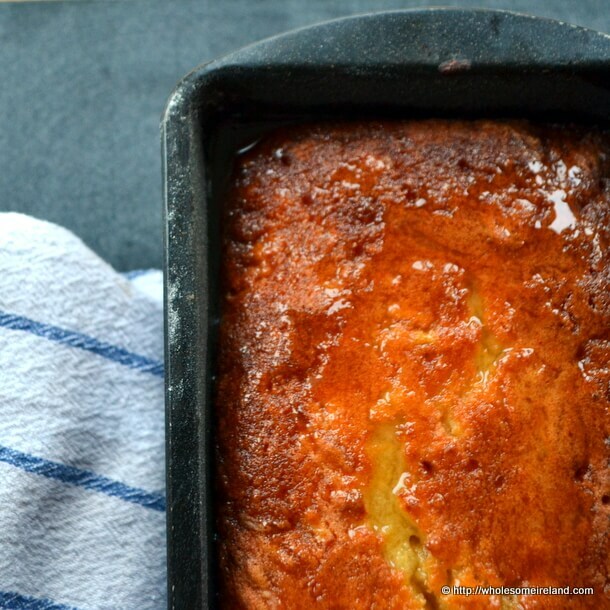 This recipe makes 1 x 2lb loaf tin of lemon cake. It does require a decent amount of time in the oven to allow the potatoes to cook properly in the cake mix. Preheat your (fan) oven to 170 degrees Celcius. Grease your loaf tin well and dust liberally with flour. Once you do this there is no need to line the tin. In a large bowl, cream the butter and sugar until light and fluffy, add the golden syrup and beat well. Break in the 2 eggs and mix until they are well combined, you will need to beat well for at least 3 mins. Add the lemon rind, flour and baking powder and beat again until combined. Finally, stir in the grated potato. Pour the cake batter into the pre-prepared loaf tin. Stir together the drizzle mixture of lemon juice and caster sugar then leave to one side. Bake in the oven for 55 minutes, after which time test the very centre with a cocktail stick. If it comes out clean then it’s baked, if not bake for a further 10 minutes and test again. Carefully, using the cocktail stick, poke holes along the top of the cake while still in the tin. Pour the drizzle over the cake while still warm and leave to cool before slicing and serving. I think it tastes best with a mug of tea or three. Note: I was provided with a number of samples of pre-packed potatoes by Sam Dennigans for the purposes of this review. My opinions are my own and I have not been paid to give them. Aoife from The Daily Spud reviewed these potatoes last weekend if you’re interested in another point of view. Sonairte, or the National Ecology Centre, is a fantastic resource, do go visit. Donate if you can, or volunteer your time & skills if you have them to spare. This will have to go on the list to try Caitriona – sounds almost like a sweet boxty loaf. I normally use cooked potato if I’m making a cake like this, so it’ll be interesting to give your version a whirl (and I don’t think I’ve ever said no to something with lemon drizzle on top…). Sorry you missed the day out at Sonairte, it was well worth the trip out. I love sweet potatoes and it looks good. So glad I found your blog. potato cake reminds me of a very indecisive tomato who [in my head] is chairing the national debate of whether to become a full time vegetable or a fruit. Sounds delish! My mum used to make a lemon drizzle cake like that, but hers certainly didn’t have spuds in it. I might have to try this one. It’s amazing how we assume that spuds should be savoury I think. Because they’re high in starch they just turn sweet in the cake!